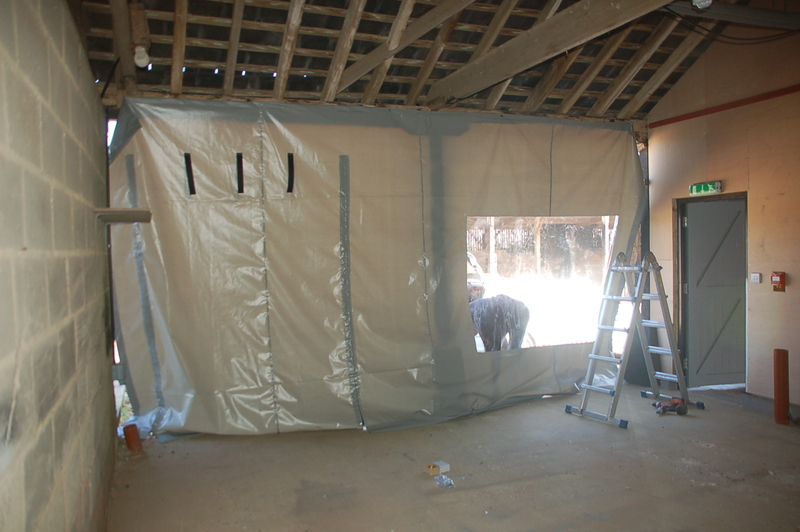 After 189 posts dating back to 6 September 2012, this will be the last entry on the blog as we have finished the main renovation of Copdock Hall barn. 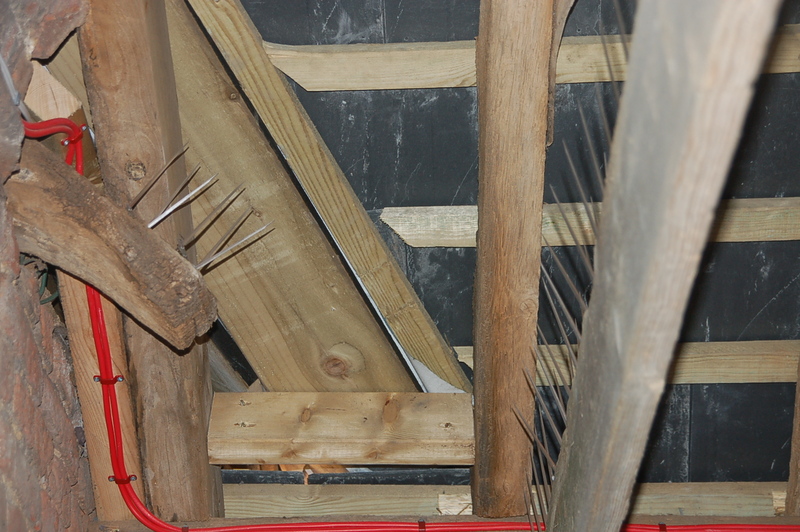 I may resurrect it if we do further work on the complex but for now it is complete. 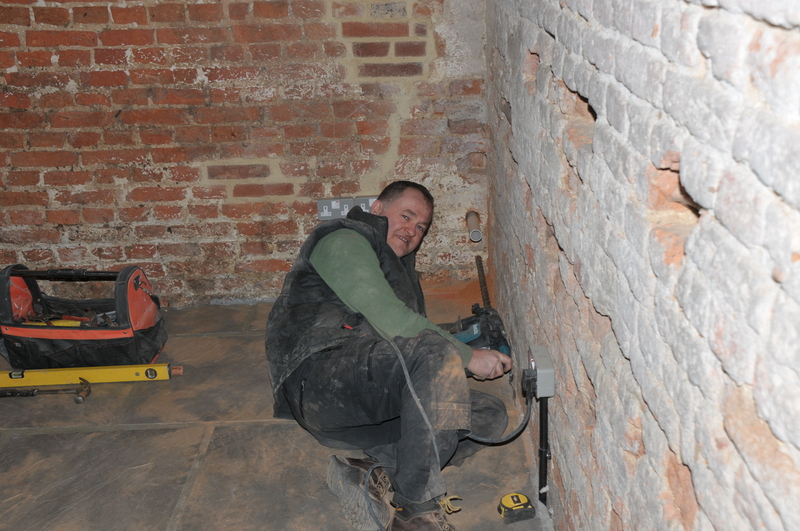 I thank all the tradesmen and workers who have had a camera shoved in their faces over the past year or so to provide pictures for this chronology of the work undertaken at the site. 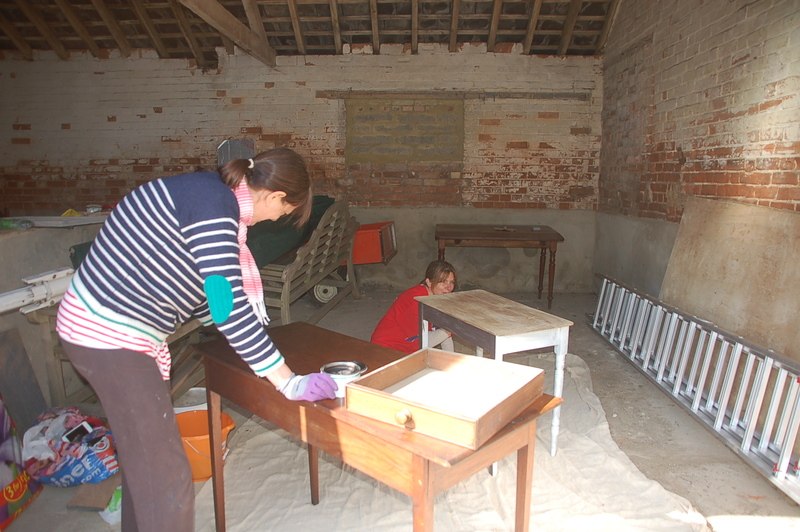 Bit of a sad day but with the wedding fair tomorrow, Sunday, it’s an appropriate time to pause but the site will remain as an historical record and linked to our main website http://www.copdockhall.com/. 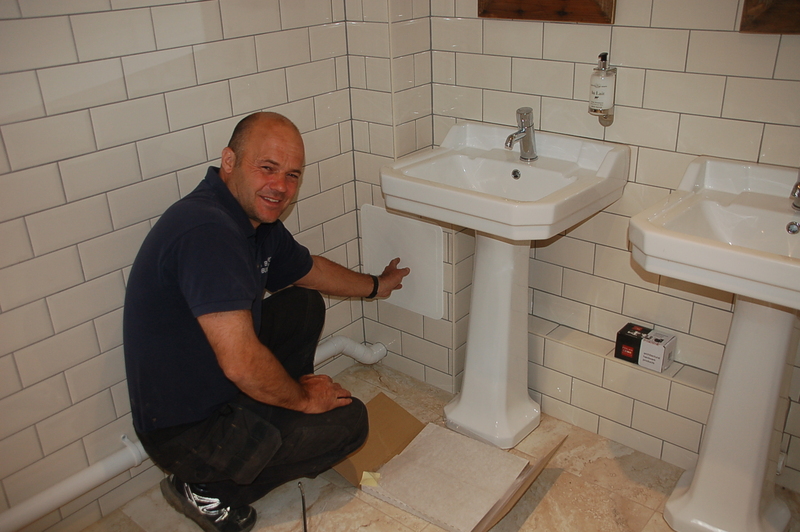 Appropriately again, the last post here is Nigel the builder fitting a cover to a small hatch in the gents’ toilet which gives access to the water pipes and meters. 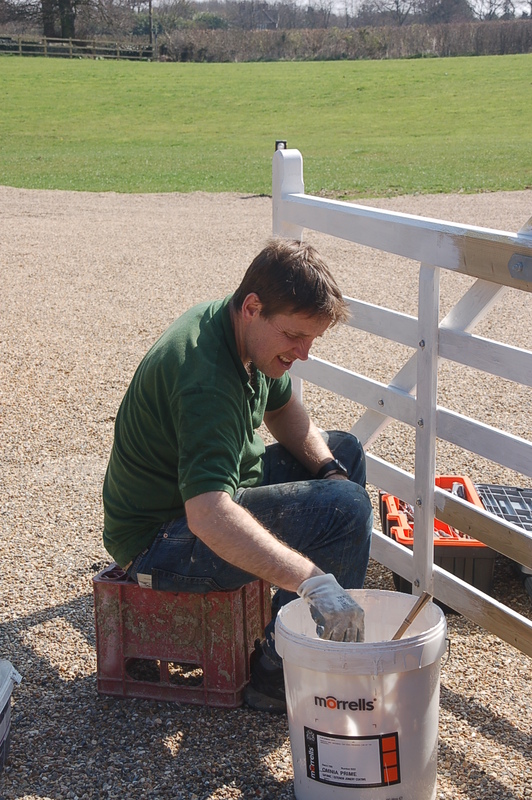 Thanks for reading the blog and do catch up with our day-to-day goings on via the website and Facebook page. 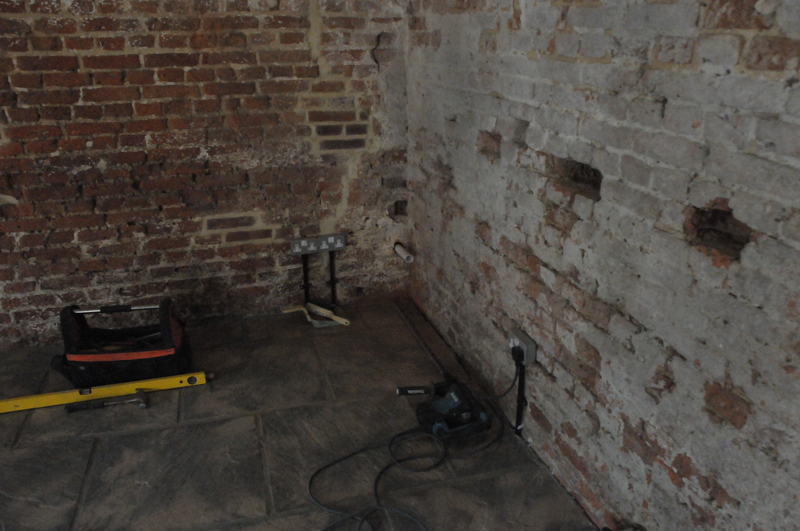 One of the final jobs has been to install a temporary cover for the designated kitchen area. 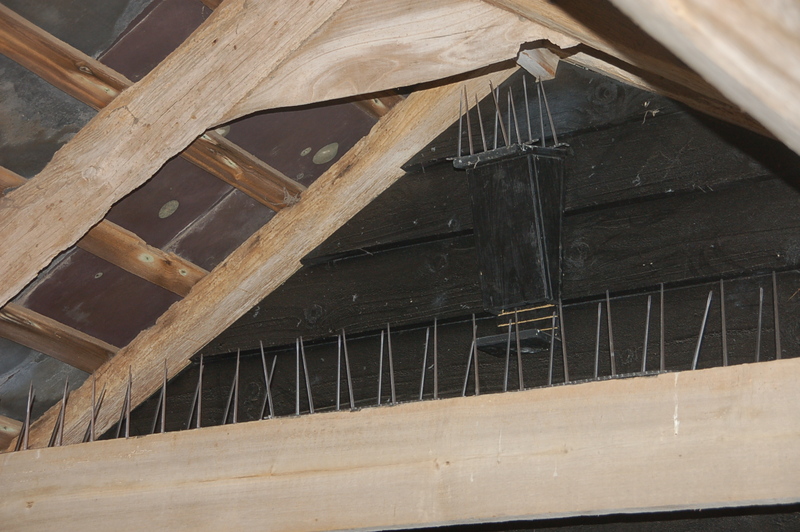 We needed something to give caterers protection while also excluding the local birdlife and their waste products. 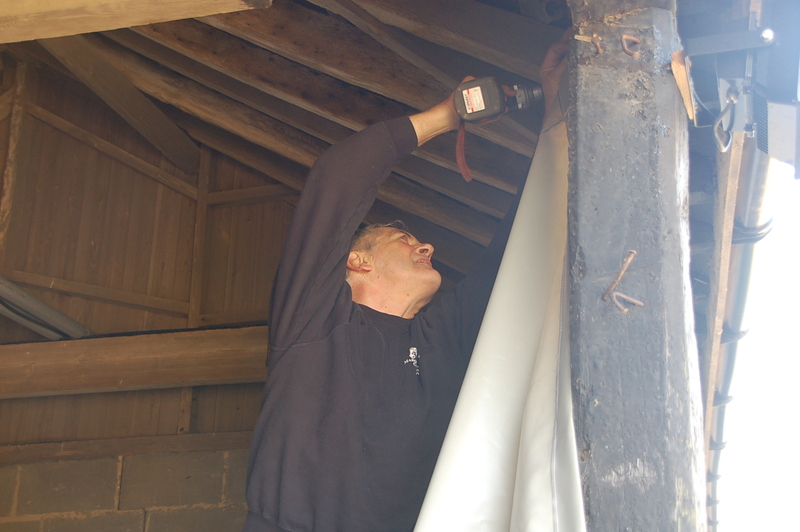 It was a last minute job but Gale Rush from Ipswich Tarpaulin Company came to the rescue, making and installing a tarpaulin cover in time for Sunday’s wedding fair. 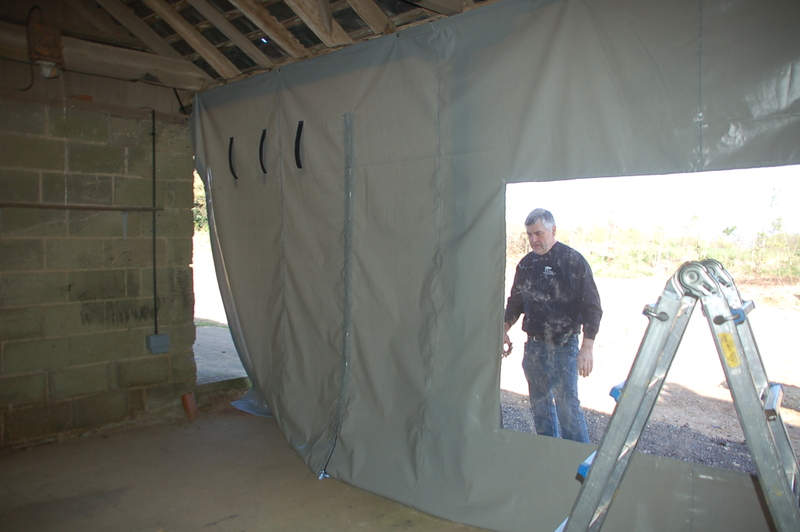 It was a sad day at the barn today as we waved goodbye to the builders’ caravan which, to be honest, was starting to look a bit pikey. 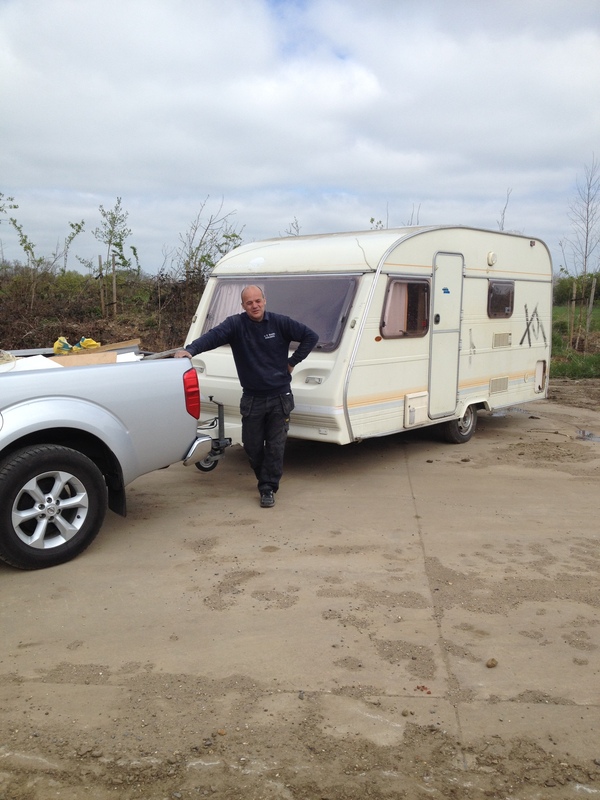 Nigel shed a tear as he drove it off to the great caravan park in the sky. 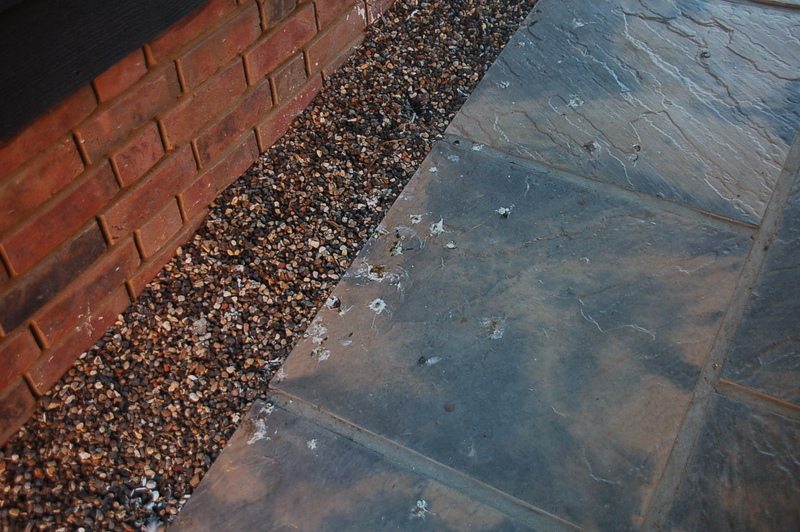 Ken Livingstone famously called them ‘flying rats’ – an appropriate description for bleedin’ pigeons. They get everywhere and are quite happy to leave the contents of their bowels everywhere…in this case in the lobby between the kitchen/boiler room and barn. 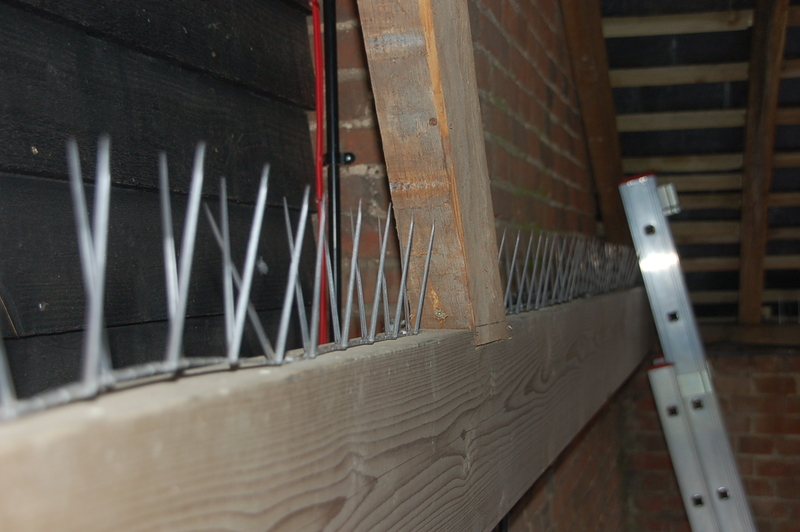 To combat their little hidey hole I’ve had to put up anti-pigeon spikes on almost every ledge. At the least the caterers will be safe. 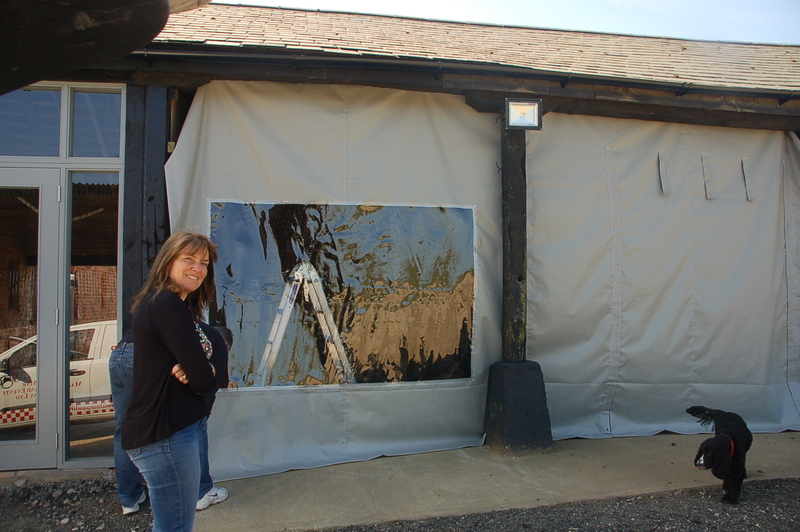 …who is the fairest of them all? 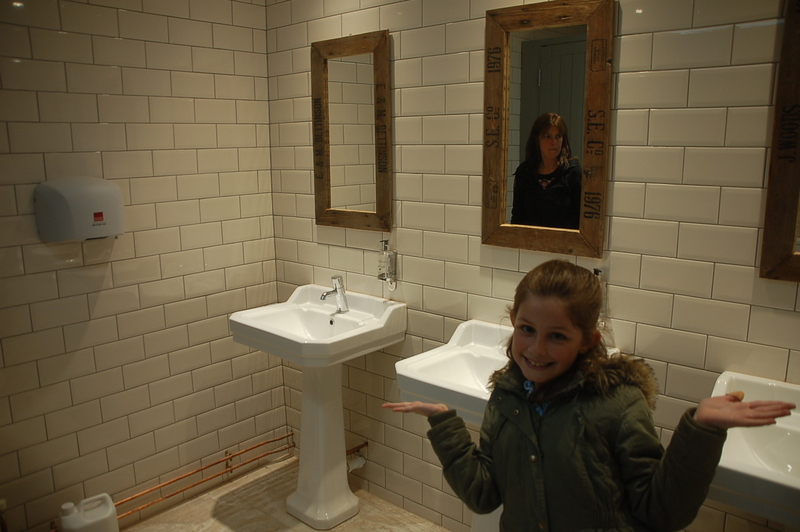 Bonnie and Diane share differing stances alongside the new mirrors in the ladies loo. 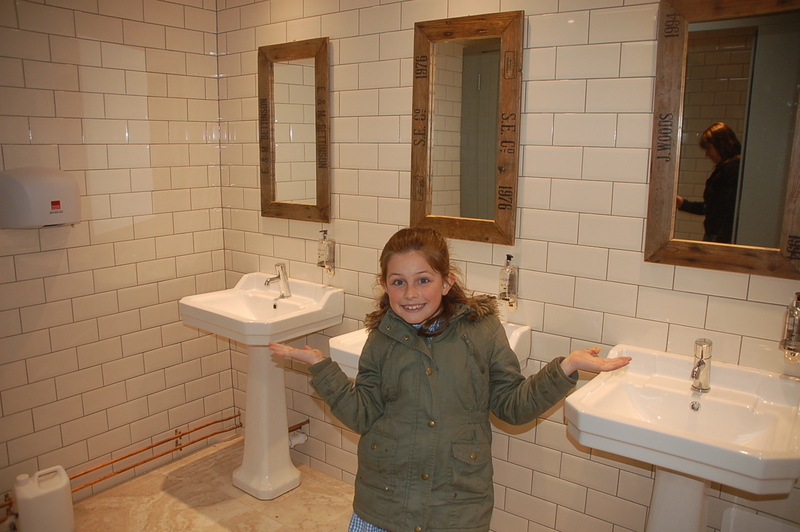 Most of the fixtures and fittings are now in which has been a great effort by Diane. 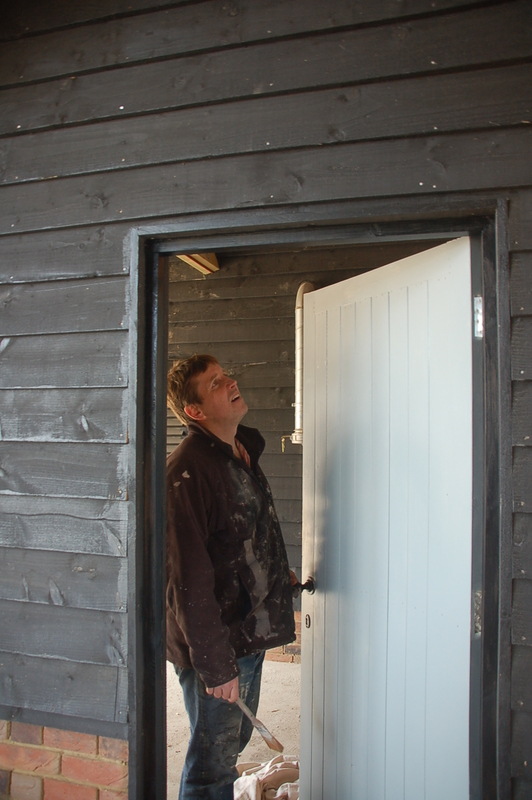 After a coat of primer and two of paint, the entrance gate to the courtyard is painted and ready for opening and shutting…and locking. It’s only a gate but I’ve fallen in love with it. Well…it’s official. 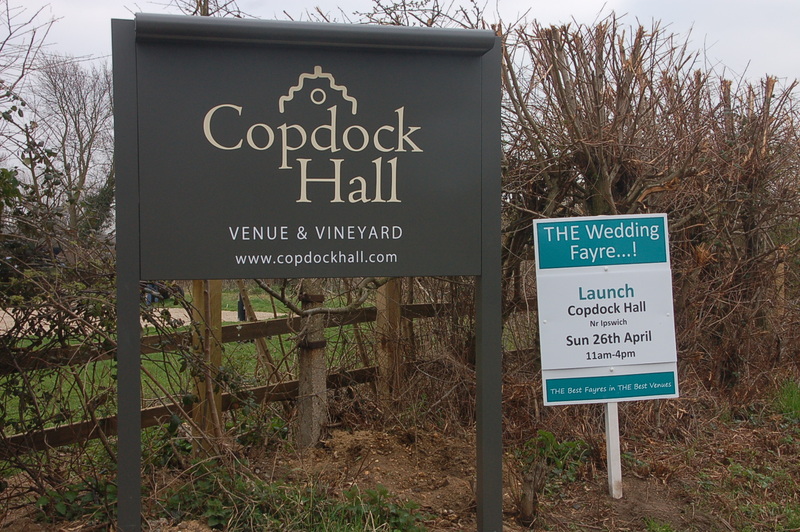 Signs have gone out in the area and at the entrance to Copdock Hall advertising our Wedding Fair on 26 April. At this stage we don’t know how many people will attend…20, 200, 2000? For that reason we are also holding an opening day/summer tea on 28 June from 12 noon to 4pm when tea and cakes will be available, raising money for neighbouring St Peter’s Church which will also be open. In truth we’d rather non-bride and grooms come then when things will be less busy. 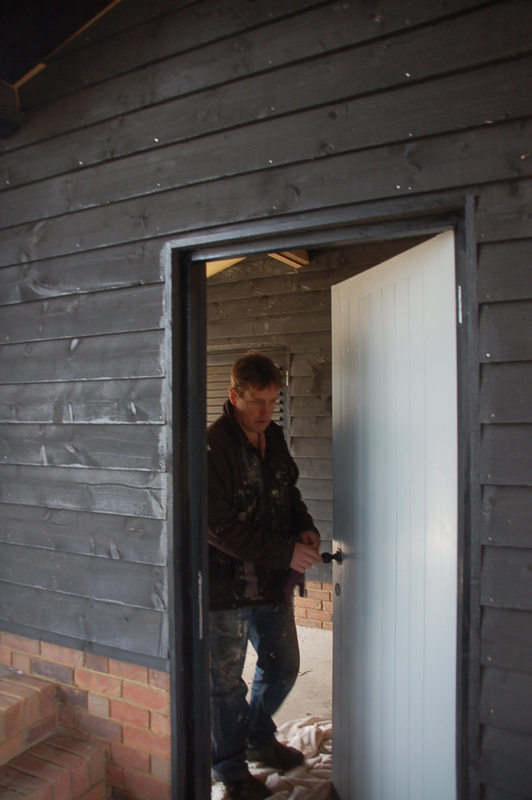 We’re coming to the business end of the renovation with the internal dressing of Copdock Hall barn and the finishing touches to things like gates and outside doors. 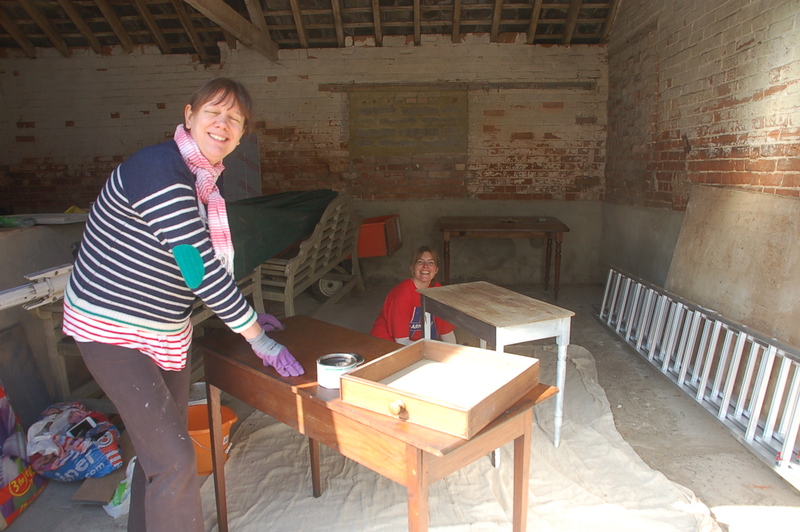 To help Diane with the tasteful decoration of the main barn and Walsingham Room, our old friend Louise came up from London with her boys to spend a couple of days helping out, painting and basically wittering about cushions, plants, types of paint and furniture. 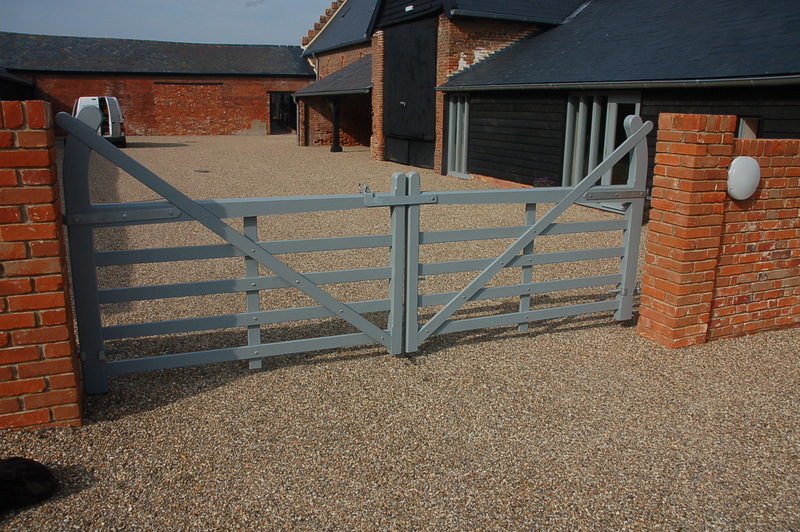 I, meanwhile, painted some gates.